RuneScape takes place in the fantasy-themed realm of Gielinor, which is divided into several different kingdoms, regions, and areas. Players can travel throughout the gaming world on foot, by using magical teleportation spells or devices or mechanical means of transportation. Each region offers different types of monsters, materials, and quests to challenge players. New players used begin by playing a tutorial quest, Unstable Foundations. They are led on a set path where they learn most of the non-member skills needed to succeed in Gielinor, the realm of RuneScape. After completing the tutorial, players can access information from tutors located in the towns they explore, or from an advisor button which can be accessed at any time. The advisor can give helpful information on different topics including money making, skills, and various items. Some stores and shops also provide free samples of low level equipment and the basic items needed for various skills. Players are shown on the screen as customizable avatars. They set their own goals and objectives, deciding which of the available activities to pursue. There is no linear path that must be followed. 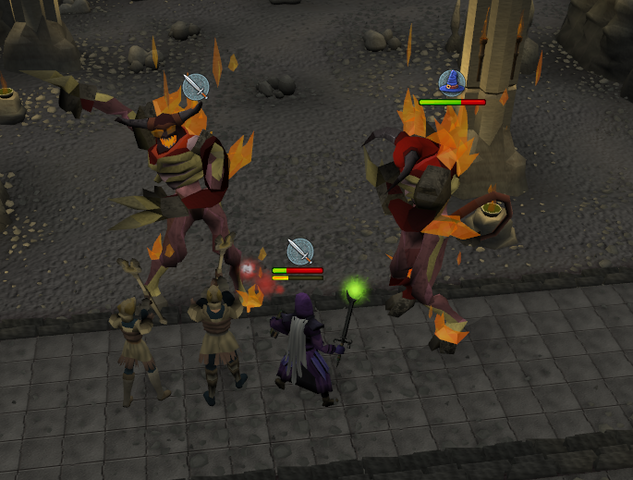 Players can engage in combat with other players or with computer controlled monsters (NPCs), complete quests, or increase their experience in any of the available skills. Players interact with each other through trading, chatting, or playing combative or cooperative minigames.